Dodging Severe Thunderstorms, Flooding and Tornados . . . Tis the Season! Saturday morning, April 23, Bonnie and I headed north from Winona, before turning west from Memphis, and then heading northwest in Arkansas. 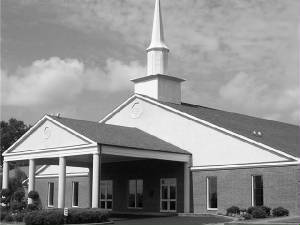 Our destination – Batesville, AR and specifically the Southside Church of Christ. There are brethren worldwide that we have yet to meet, which simply means that there are oodles of friends in Christ with whom we are not acquainted – yet. 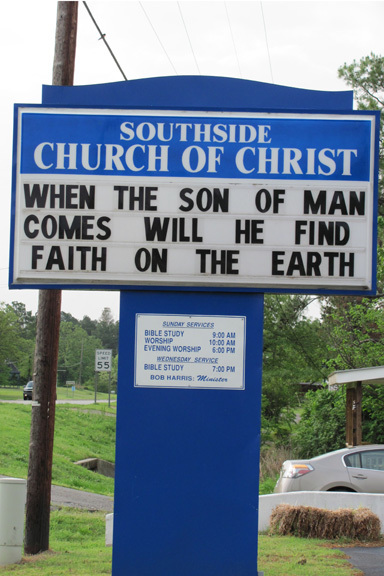 Such was the case respecting the Southside Church of Christ just south of Batesville. For the Bible class, I made my PowerPoint presentation, Motivated by the Cross, about our trips in 2010 to India and Myanmar (Burma). During worship that morning, I made my PowerPoint presentation about Bible Archaeology; it is a faith-building lesson that reassures Bible believers that they have correctly placed their confidence in the Word of God. Afterward, Bonnie and I were absorbed by the extended Bob Harris family into their Sunday holiday lunch: tasty ham with a variety of complementary southern dishes and accented with scrumptiously delicious desserts, including pecan pie and a chocolate swirl pudding cake (don’t know the real name of it). I feel like we have made some lasting friends from among brethren previously with whom we had been unacquainted. The Southside church made an initial financial participation in the work for the Lord to which Bonnie and I devote ourselves daily. By 2:00 p.m., Bonnie and I headed beneath ominously dark clouds across ribbons of secondary highways between flooded fields toward our evening appointment. 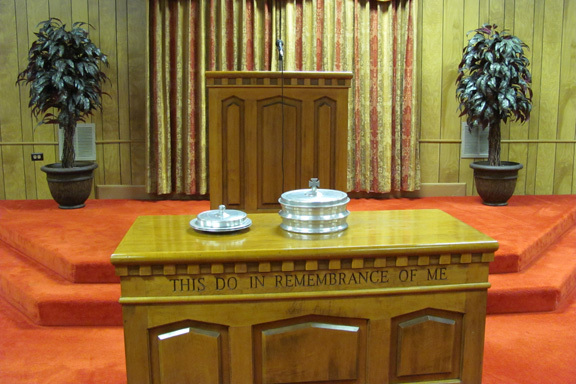 Fortunately, when we arrived at the meetinghouse of the Biggers, AR Church of Christ early, the doors were unlocked. Bonnie and I got inside and set things up for the evening service just before the bottom fell out of the angry, black clouds overhead. Some of the members were not as fortunate, and they sported raindrop Pokka dotted shirts and blouses upon entrance to the building. The vigorous storming relented by the conclusion of services. The brethren, though few in number these days, are always delighted to see us and we to see them. 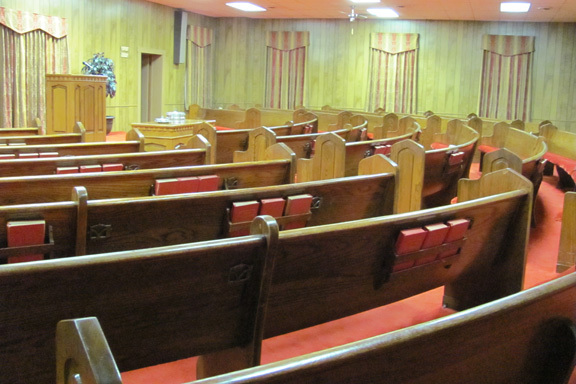 The antique auditorium with curved pews dating to 1931 and able to seat 185 or so accommodates from eight to 15 precious souls today. Nevertheless, percentage wise, the local membership represents about 5% of the village population. Their preacher, legally blind, led singing completely by memory. He loves my PDF books, in part, because they can be enlarged on a computer to where even he can read them. Everything about the Biggers Church of Christ encourages Bonnie and me. We are proud to be the recipients of monthly support in our missionary work from this gallant congregation. Services over, Bonnie and I headed for our own Bed & Breakfast of sorts, our daughter Rebecca’s home in Collierville, TN. Monday, we wended our way through some shopping on our way back to Winona. Back at the house, we finished the afternoon planting some flowers we picked up while out. That night, again came the severe thunderstorms, and especially the areas in which we had been Sunday suffered the brunt and fury of the ill-tempered weather. Rebecca’s hometown, too, was buffeted last night with tornadic activity, but North Little Rock, AR took a beating, and several people lost their lives. The South has endured a record number of tornados and severe weather and the bad weather season is barely begun, but more is forecast to come. Our sleep of late has been uneasy due to the severe weather, including tornado warnings, but alas we must be ready for glory at all times in all places. Comments: Comments Off on Dodging Severe Thunderstorms, Flooding and Tornados . . . Tis the Season! Over the weekend, Bonnie and I visited our daughter and the Collierville Church of Christ. Not otherwise committed to an appointment and having agreed to participate in the Collierville congregation’s 2011 Guyana mission trip, we attended an afternoon meeting Sunday respecting that trip. It was also important for us transfer funds for our plane tickets to Guyana – over $2,400 – which is about half of what we have on hand presently (a matter of concern). This trip will require several hundred dollars beyond the airfare for ground travel, lodging and meals. In the fall, we will also be traveling to Myanmar (Burma) and India on mission trips. Those occasions will also necessitate acquiring significant funding from Christians and churches of Christ to make those efforts possible. Otherwise, Bonnie and I continue to travel extensively stateside to apprise congregations about our mission work and to present additional biblical lessons. Over the next several weeks, we will be in Arkansas, Alabama, Georgia, Florida, Kentucky, West Virginia, Ohio, Tennessee and Pennsylvania. In November, Bonnie will squeeze in a ladies retreat in South Carolina. I am scheduling Gospel meetings through 2014. Meanwhile back at the ranch, we package and ship books as well as work on literature production and field calls, emails and letters. We never have to experience boredom, but merely need to choose either what has to be done next or at least something other than what we have been doing for hours already to find sufficient variation. Bonnie and I interjected yard work, fence construction and flower gardening into daylight hours and beyond last week, which we will continue today. One night last week, the daylight escaped before we completed installation of one fence panel, and we had to finish by flashlight! My aging, American-rounded body is complaining with joint and muscle pains, but personal satisfaction massages the discomfort. Friday, April 15, I was finally able to get Gospel Gazette Online for April 2011 completed and uploaded to the Internet. Especially, Wednesday through Friday we concentrated on GGO (everything in our lives triage — that is, “What’s next?”). The icing on the cake was the audio lesson that brother Tim Childs got to me Friday afternoon; he does such a good job with both the content and the audible presentation. In addition to the 27 articles over 15 pages in this issue, thousands of articles remain archived. The search engine will help readers select religious topics of interest. Two of the writers are new to the pages of Gospel Gazette Online, one of whom is 18-years-old. Please let us know how the articles and the site work for you. Tell others about www.gospelgazette.com. You may want to look at the new postings from several countries in the Guest Book. Go directly to the new issue at: http://www.gospelgazette.com/gazette/2011/apr/page1.html. Tuesday, April 12, at long last or so it seems, two manuscripts and dozens of support files were finally ready to be sent to the printing company we use in South Carolina. 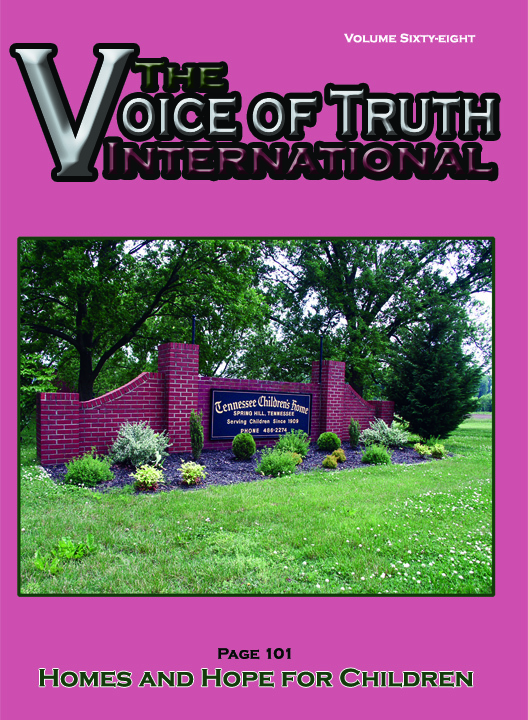 On one CD, we sent all of the files that may be needed to produce Volume 68 of The Voice of Truth International magazine. With everything else in which we and those with whom we labor are involved, it nearly takes us a quarter to prepare the quarterly journal for the next publication date. VOTI goes into about 80 nations in English, and other languages of the publication circulate in American and India. In addition, other regional magazines across the planet use The Voice of Truth International as the source material for their articles in numerous languages. 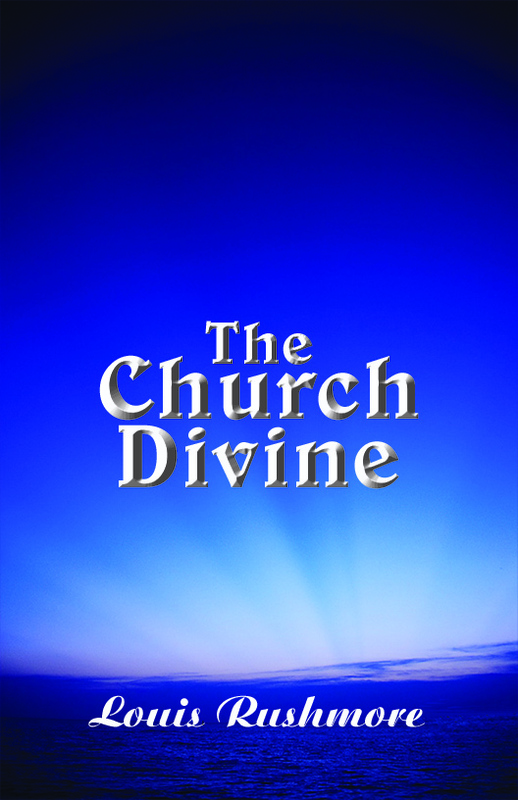 The second manuscript in digital format sent to the printers is my book The Church Divine. It has been out of print for some time, but in a matter of weeks it once more will be available. It is a Bible class book pertaining to the identity of the church for which Jesus Christ died to establish, over which He is the Head and for which one day he will return. A new chart prefaces each chapter and questions round out each lesson. The chapters are: The Church is Divine in Name, Origin, Organization, Worship, Doctrine, Unity, Mission, Baptism, Discipline, Godhead, Fellowship, Spirit and Love. Since Bonnie and I can hardly express enough gratitude to the Christian brethren who make our mission work and labors stateside and abroad possible, this volume is dedicated to one Christian couple who exemplify them all. This dear brother and sister couple is dear to our hearts. Who are they? They and you will just have to wait until the book is hot off the press! Comments: Comments Off on Hot Off the Press! Sunday, April 10, Bonnie and I made our way to the Siwell Rd. 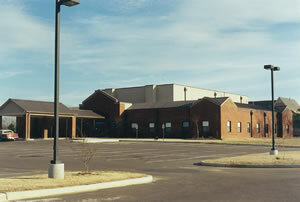 Church of Christ in Jackson, MS. Unusual for us, we were able to remain in Winona on Saturday since our Sunday destination was close enough for Sunday morning travel or otherwise, Close Encounters. During Bible class, I made the PowerPoint presentation Motivated by the Cross about our mission trips in 2010 to India and Myanmar. I probably should stop tossing those plastic bags of foreign coins into the audience; a number of circumstances could arise, not the least of which is collateral damage if my aim is off, someone doesn’t catch or someone else doesn’t duck! Of course, splattering coins from three nations all over the auditorium would be inconvenient, too. I do hope brethren appreciate the coins, Buddhist prayer beads and currency from five Asia nations that circulate from person to person while I make that presentation. During worship, I made my PowerPoint presentation about Bible Archaeology; it is a faith reassuring lesson that shows that Bible believers have every reason for confidence in God’s revealed Word. Several found the lesson interesting since they had not heard a presentation like it before. Following a meeting with the elders and deacon over missions, Bonnie and I were treated to Chinese cuisine and hosted by W.E. and Judy Walker in their home for the afternoon. Sunday evening, it was our pleasure to make our annual visit with the Clinton, MS Church of Christ. Some of these brethren we have known for decades, whereas others are fast becoming friends. After updating the congregation about our 2010 mission trips with my lesson Motivated by the Cross, John and Erin Allan (young preacher and his wife) plus their infant boy treated Bonnie and me to a fine meal at a local Mexican restaurant. We enjoyed each other’s company far beyond the duration of supper, but finally had to part company; Bonnie and I arrived back in Winona, MS around 11 p.m. – tired and ready to retire for the night, but pleased with the day the Lord had made for us (Psalm 118:24). Monday morning, sitting across the breakfast table at our Winona, MS home were Yong and Peter DeGraff. Residing in Georgia not far from Chattanooga, TN, they came to visit Bonnie and me for a week. Originally, we thought that they would be in the area and while here they would lodge with us, for which we were glad. However, we discovered that we were the destination! The four of us spent the days and late nights together at the World Evangelism building and at our home. Though on vacation, Peter and Yong were diligent volunteer workers and home project completers. The DeGraffs proofed the upcoming issue of The Voice of Truth International magazine and processed a bulk mailing to donors of relief funds for an ailing, retired missionary and the Japan disasters. Restless sometimes and eager to serve, Yong also weeded the shrubbery area in front of the warehouse/office building and did some general cleaning in the office. Peter substituted burned fluorescent bulbs for new ones and replaced some worn out ballasts; he also attempted to remedy a Windows software error and helped set up replacement backup drives for the office computer network. 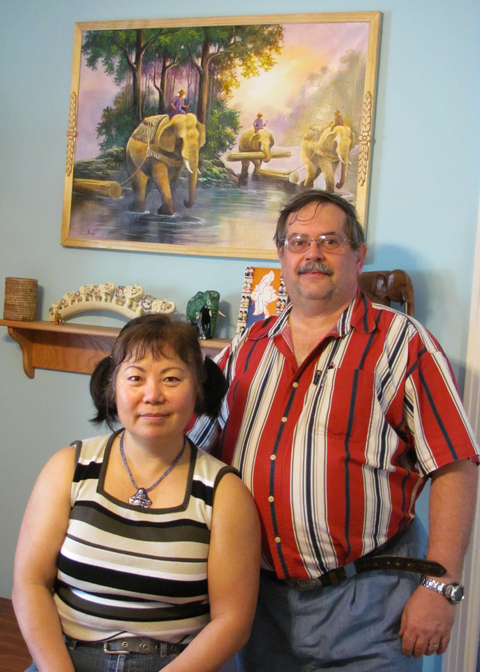 At the house, Yong and Bonnie repotted an indoor tree; Peter and I built picture frames for my latest train, puzzle picture and an oil on canvass picture from Burma of elephants, both of which have been begging for attention for years. Yong thought our Cracker Barrel style home décor was museum-like, and she snapped a few pictures. 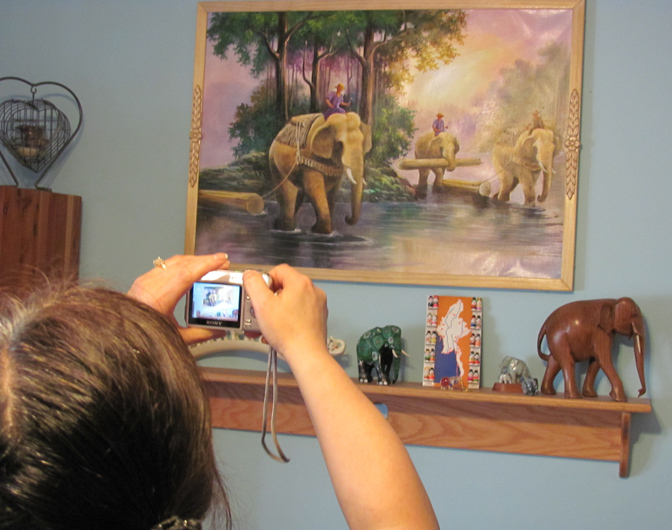 We had no more than hung the picture of the elephants and she took a picture of it. Bonnie and I did not intentionally begin a collection of elephants, but one end of our bedroom has become the trove for our multiplying pachyderms. 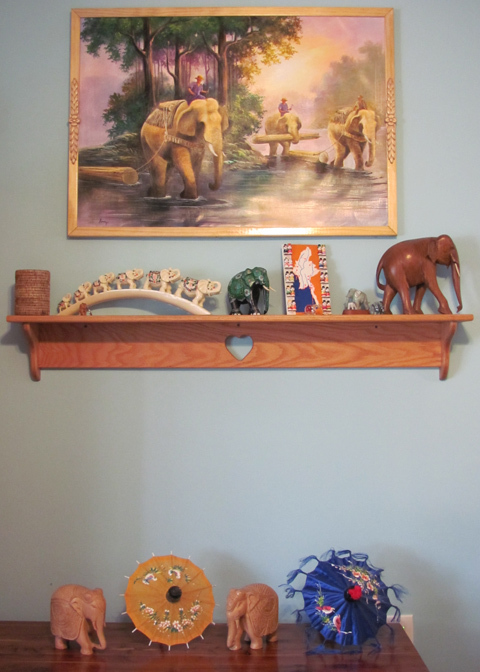 Betty Choate’s elephant collection far exceeds ours, but we have no plans to compete. Betty Choate prepared lunch one afternoon and supper one evening. Another night, Bonnie prepared a good meal for all of us, including Betty Choate and her mother Theola Burton. With good food involved among brethren, a good time was had by all. The Rushmores and the DeGraffs have a lot in common, and we enjoyed each other’s company. Some of the good times were working together, eating at home together or eating at outstanding eateries in Winona (Chinese and Mexican restaurants) and elsewhere (Texas Roadhouse). Good friends and brethren plus good eats! Too, we had one more opportunity to visit with our daughter, at which time we introduced Yong and Peter. May our Almighty God use each of us as tools in His hands, whereby we can glorify Him and edify souls. Comments: Comments Off on We Were the Destination! To Snake Road and Back! April 3, Bonnie and I set out for rural Rogersville, AL via Columbus, MS. Sunday morning we made an unannounced visit with the Tenth Avenue Church of Christ in Columbus, MS. Robert Johnson, who preaches for the congregation there, and his wife Emma are dear friends of ours. No family of Christians we visit make us more welcome as numerous brothers and sisters make a special effort to greet us. We were surprised to find that Bible class began earlier than we remembered. Following worship, we hasted to have a meal together before continuing our journey to Rogersville, AL. Hours later, Bonnie and I drove into the parking lot of the Cedar Grove Church of Christ on “Snake Road.” We had never been there before, but as usually is the case, we were delighted to become acquainted with brethren previously unknown to us. It remains to be seen whether this congregation will be able to or choose to participate with Bonnie and me in our mission work. However, this church deserves commendation in that it chooses to devote 50% of its contribution to mission work. This is especially admirable since our Lord immediately preceding His Ascension assigned His followers only one job to perform – to evangelize the world with the Gospel. Comments: Comments Off on To Snake Road and Back!